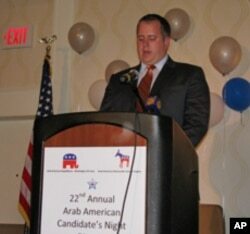 Virginia Congressman Jim Moran addresses Arab-American voters at a recent candidates' night event. With less than three weeks to go before election day, candidates around the country are stepping up their efforts to reach voters. In northern Virginia, just outside Washington, D.C., Congressional candidates attended a forum which was organized for Arab-American voters. The controversy over the proposed Islamic Cultural Center in New York City was a hot topic at the candidates night, and one that Democratic and Republican candidates agreed on. They assured Arab-American voters that they back civil and religious freedoms. The audience responded to Democratic Rep. Jim Moran's statement with a standing ovation. "I felt so strongly that the Islamic Center which was headed by a very moderate thoughtful Imam, which would have housed places of worship for all the major Abrahamic religions, should have been located exactly where it was going to be located because that is the message we send to the rest of the world," he said. Republican Robert Gasiewicz expressed support for the building of an Islamic cultural center in New York City. Moran's challenger for his seat in Congress is Republican Patrick Murray, who sent his campaign media director, Robert Gasiewicz, to the event on his behalf. "No government should be stepping in to tell one religion or another what they should and should not do, what they should and should not build," said Gasiewicz. "And, quite frankly, it has been part of our heritage that people came across the ocean to escape religious persecution in England. They wanted to worship freely here." Virginia's Arab-American Candidates Night has been a tradition since 1987. It is a bi-partisan event, but a recent survey of Arab-American voters shows they favor Democratic candidates by a two to one margin. Saba Shami (left), founder of the Arab American Democratic Caucus, speaks with Virginia Congressman Jerry Connolly (right). "President Obama talked about issues that both Arab-American Republicans and Arab-American Democrats related to," he said. "And therefore, even though our view is that his intentions have been obstructed, Arab-Americans still have the hope that in the second half of his administration hopefully he can do something." According to Elshami, Arab-Americans tend to vote on the issues and not for one political party or the other. 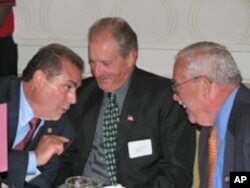 However, Democratic Rep. Gerry Connolly argued that there is a shift towards his party. "In recent years, the Arab-American community has re-assessed its political alignment," said Connolly. "Frankly, it has found a much more welcoming home in the Democratic party in terms of appreciation for diversity, tolerance - whether it be religious tolerance, whether it be tolerance for different ethnicities - so I think we have seen a real sea-change in the Arab-American community attitudes about the two parties and a lot more affinity for the Democratic party." Voter turnout is traditionally low for a midterm election, when presidential candidates are not on the ballot. Arab-American political activists are doing their part to mobilize voters. "Calling people by doing phone banks. We print flyers, multi-lingual flyers. We do Arabic and English because some elements of our community are not proficient in Arabic," said Saba Shami, founder of the Arab American Democratic Caucus. "And we use some of the media available to us. In the past we used to have a local TV station, but currently there is not one, but there is a newspaper so that is another venue. We publish it in the form of an ad so we can talk about the campaigns as information for the community." Arab-American activists are hosting similar candidates nights all over the country. 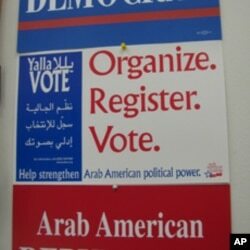 In some states, they're also organizing events to show Arab-American voters how to use new voting machines. Their slogan, three weeks before the mid-term election, is "Yalla Vote", which means, "Come on, Vote."